This is the first of two board game based solitaire games. 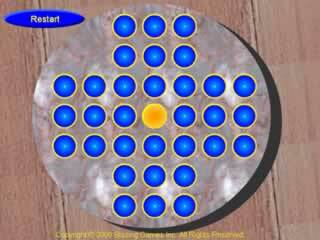 The version of the game I have uses chips, but I have heard that there are versions that uses pegs or marbles instead. The goal is to jump over pieces (horizontally or vertically) until you are left with only one piece and that piece has to be in the middle of the board. I have decided to use marbles for this version of the game. Playing the game is very easy. Select the marble you want to move by clicking on it. You can only select marbles that are able to jump over another marble. Once selected, the marble will start to glow. If you have changed your mind, select the marble again to de-select it otherwise select the destination. You will be told when there are no moves left. Press the restart button in the top left corner to reset the board and start over. Note that the french board initially starts out with marbles along the edges missing, though the goal is still to end up with a marble in the middle. The different marble layout is due to the fact that as designed, the french version is not solvable. This layout is solvable. This game requires the Flash Player 7 or greater plugin be installed in your brower. You can get this plugin at Adobe's web site by clicking here. Copyright © 2006 Blazing Games Inc. All Rights Reserved.